Chronic Obstructive Pulmonary Disease (COPD) was the second highest cause of death in India after heart disease in 2017, killing 1 million (958,000) Indians that year, according to University of Washington’s Global Burden of Disease study, 2018. COPD led to 13% of all deaths in India, and 7.5 million were at risk of the disease in 2016, IndiaSpend reported in January 2018. COPD is an incurable and progressive condition, which inflames airways in the lungs and destroys air sacs, which extract oxygen from the air and expel waste, including carbon dioxide. Patients often cough, wheeze and are short of breath. COPD can be caused by long-term exposure to lung irritants and toxins in the air. 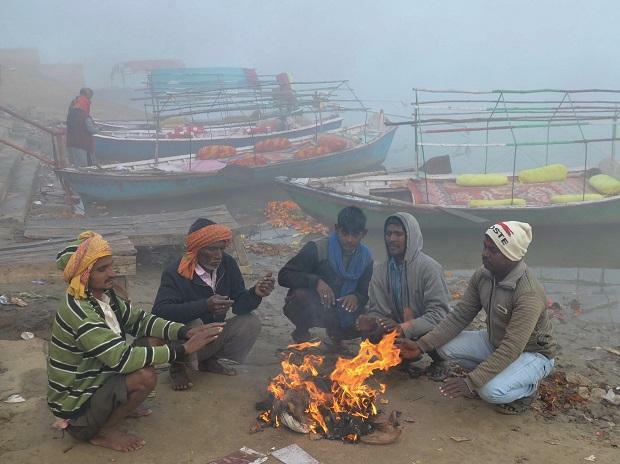 In the West, a majority of COPD cases are caused by smoking tobacco, but in the developing world, including India, most COPD cases spring from exposure to indoor and outdoor air pollution, particularly burning biomass, from wood to cow dung. Knowledge about non-smoking risk factors for COPD is only about a decade old, and one of the researchers instrumental in proving India’s burden is primarily because of burning biomass for fuel is Sundeep Salvi, 53, Director of Chest Research Foundation (CRF) in Pune, which he helped establish. CRF is a leading research institute dedicated to research on chronic respiratory diseases, especially COPD and asthma. The 30-member team of researchers at CRF collaborates with international institutes, including Imperial College in the UK, Johns Hopkins University and Massachusetts Institute of Technology in the USA, and McMaster University, Canada. Salvi is also a member of Global Initiative for Obstructive Lung Disease, founded by the World Health Organization and national health institutes in the USA, to improve diagnosis and treatment of COPD, and is a fellow and visiting faculty of Imperial College, London and John Hopkins University in Baltimore. Salvi talked to IndiaSpend about the under-diagnosis of COPD in India, the implications of rising air pollution in India’s cities for COPD risk, and the need for a multi-pronged policy approach. Excerpts. Why haven’t we heard more about COPD, though it is the second-highest killer after heart disease in India, responsible for 958,000 deaths in 2017? COPD is one of the badly neglected chronic lung diseases--though all chronic lung diseases have been generally neglected, including in India--despite (the fact that) lung diseases affect all organs of the body, and it poses a high burden. First, India has faced the rampage of communicable diseases, such as tuberculosis, malaria and HIV-AIDS, for so long now that we feel we have somehow conquered communicable disease. Now, the incidence of non-communicable diseases is on the rise. COPD is a good example of a non-communicable disease that remains neglected. Secondly, levels of air pollution have risen dramatically over the last two to three decades. That has had a major impact on COPD. Thirdly, all these years COPD was primarily thought to have been caused by tobacco smoking, because that is how it is caused in the rest of the world. But in this part of the world, most COPD cases are because of non-smoking risk factors. Since there has been no research in this field in all those years, it is only very recently that we have been able to generate that knowledge. It is this new knowledge that has shaped the appearance of COPD as a big threat in India. While these are the top three reasons why COPD is not well known, there are others as well. Diagnosing COPD is a challenge. It is easy to determine the burden of hypertension in India, by measuring blood pressure of a random sample of the population. The technique is very simple. Similarly, a simple blood check can determine the burden of diabetes in a community. It is not so for COPD, a disease which requires sophisticated diagnostic tools. 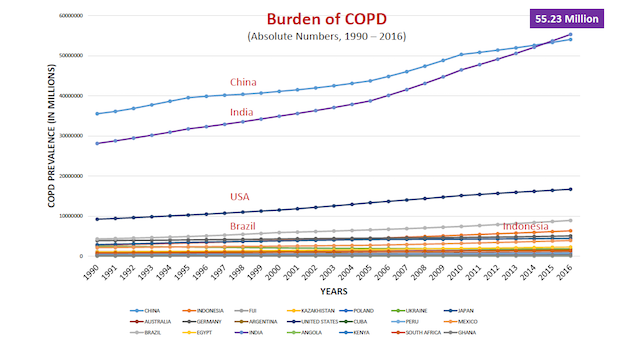 Have the COPD estimates in the Global Burden of Disease (GBD) study by Institute of Health Metrics and Evaluation, University of Washington--which has systematically released data on global mortality and mortality since 2013--improved awareness? The GBD study brought into the limelight neglected diseases that we were not aware of. But that also happened at a time when recent studies looked at the burden of COPD using spirometry tests [a standard test to measure lung function]. Prior to that, all COPD studies have been conducted through questionnaires and not spirometry tests. The ‘Burden of Obstructive Lung Disease’ (BOLD) is an initiative by international lung experts, who said that there is very little information about COPD, and there is a need for a standard protocol, which the whole world should use to determine the burden of disease. BOLD was started in the United States about 10-15 years ago and about 40 countries including India participated. The CRF in Pune, and a centre each from Kashmir, Mumbai and Mysore, were the four centres that took part in BOLD and these laid the foundation of COPD research in India. So, BOLD is the most authentic way of determining the burden of COPD. This research took place over the last four to five years, and this data was available for the GBD, which then built on it and determined national estimates. What was the prevalence of COPD in the BOLD study? Earlier when the studies only used questionnaires, the prevalence in India was thought to be 2-3%. Now it is about 5.5-7.5%. Kashmir has about 16% to 18% COPD prevalence, because they use biomass fuel for cooking and heating purposes, and because smoking is common. So they have dual exposure. In the 2019 GBD study on impact of air pollution on disease burden, mortality and life expectancy in India, all the northern states including Himachal Pradesh, Jammu & Kashmir and Uttarakhand had high rates of COPD and so did the southern states of Karnataka and Kerala. So is COPD incidence spread across the country and not only in the northern states? 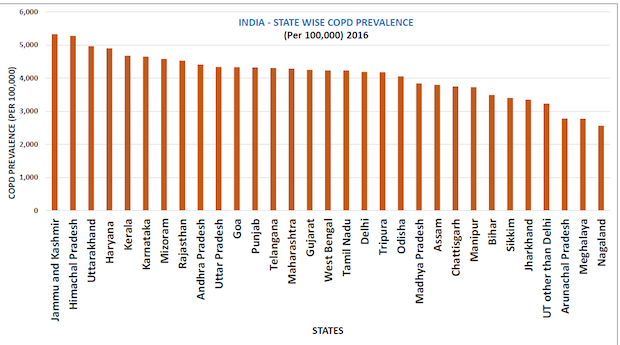 The northern region [of India] has the highest COPD prevalence. It looks like a red chunk in the COPD map of India, but there are red spots in Kerala and Karnataka also. What explains [high prevalence] in the north is the use of biomass fuel and smoking as a culture. Third, high air pollution in Delhi, for instance, is cause by stubble burning in Punjab. Because of the wind direction, air pollution created in Punjab is carried across the entire Gangetic belt. That becomes another source of air pollution. Why the high prevalence in Kerala and Karnataka? I don't know why [the prevalence is high] in Kerala. Biomass fuel is used a lot in Kerala. [I] don't know the status of smoking levels. Karnataka also uses a lot of biomass fuel. If you look at Census 2011, 68.9% of households in rural India use firewood as cooking fuel, which is huge. You were among the first in the world to say that burning biogas fuel is the leading risk factor for COPD. How did you come to that conclusion? That was a chance observation during a study looking at the lung health of people living in slums in Pune. We just used a questionnaire, not even spirometry tests. But we found that the burden of COPD is high, and most of it is not associated with tobacco smoking. That led us to do the 2011 study, which was part of the BOLD study. It was the biggest study on COPD burden in India, where 3,500 samples were collected individually from 22 villages, and we found that 85% of COPD in that population was cause by non-smoking risk factors. That gave us a big shock and subsequently we did a lot of work on other sources of air pollution. We did research on [pollution caused by burning] mosquito coils, which was again a landmark study because, for the first time, we realised that one mosquito coil is equal to 100 cigarettes, and that is what we breathe at night. Mosquito coil is thus equal to ambient air pollution in cities like Delhi. We published that in journal Chest. We then did the study on dhoop (incense) sticks and on fire crackers. All that work on researching air pollution in India was done by CRF for the first time. Which is worse? A mosquito coil or the lung disease cause by the coil? Both are bad. Whenever I say this people tell me, “Give us a better alternative and we will avoid it”. But there are no safe mosquito-repellent products. All are harmful, be it the liquid vapouriser including the mat, or the paper that you burn. I think agarbattis and dhoop sticks should be banned. What are the COPD risk factors for non-smokers? In India, the number one risk factor is biomass fuel because over 60% of homes still use it. Outdoor air pollution, indoor air pollution due to use of agarbattis, mosquito coils--all of these are risk factors. India is rich in these risk factors. Almost every Indian is exposed to outdoor risk factors. No one is exempt. The 2019 Lancet study on air pollution also said that the number one group of diseases caused by air pollution were lower respiratory tract infections, and second was COPD. What are the lower respiratory tract infections? Lower respiratory tract infections are pneumonias. The pneumonia risk is mainly in children under five. It is a big population for our country at least [13.6% of India’s population or 164.5 million is aged 0-6 years], so every year close to 1 million children die because of pneumonias and half of these are because of air pollution. If you ask me who are the most vulnerable people exposed to air pollution, it is pregnant mothers. All of them need to be educated about air pollution because the impact lasts for the rest of the baby's life. Second most vulnerable are children under the age of five, and third are people with underlying lung disease, whether asthma or underlying infections etc., and fourth are the elderly. Does India have adequate diagnostic facilities to diagnose COPD? Many years ago we did a nationwide survey with close to 2,000 randomly selected doctors and asked them if they used spirometry to detect COPD. Only 10% said they do; the rest said they relied on the patient’s history and a physical examination. That is why COPD is under-diagnosed, because doctors don’t have access to spirometry. There are many reasons why spirometry is not available. One is that doctors are themselves unaware about spirometry. They have not been taught about it in medical colleges and they have not even seen a spirometer. Second is performing a spirometry is not as easy as performing a blood pressure test or taking a blood sample for checking blood sugar. It is a very difficult test to perform, even if you have a spirometer. A patient has to blow forcefully into the spirometer. Third, after the patient has undergone the test, doctors don’t know how to interpret the result. If you give a spirometry test report to a doctor, 95 out of 100 will say they don’t even know what the results mean. Fourth is cost. The cost of a spirometer is four times that of an ECG machine, which costs Rs 25,000. The price is Rs 1 lakh ($1,407), which has come down from the earlier Rs 5 lakh ($7,037). Doctors also can't send patients to a diagnostic centre for spirometry, because tertiary care private hospitals are the only places with access to spirometry. Spirometry tests to diagnose COPD need to be available in hospitals, which means governments need to allocate money to buy spirometers and doctors need to be trained in how to interpret the results. So a multi-pronged approach is needed. We started spirometry trainings in 2005 and at that time, around four to five spirometers were sold in a year. After 2005, this increased to 300 a year, then 400 and now about 500 spirometers are being sold annually in India. Even this increase is like a drop in the ocean. There is also the problem of disease management. Doctors are not well educated to manage COPD cases. If you pick out 10 general practitioners and test their knowledge of COPD cases, it is very poor. One of the other problems with managing the disease is that the treatment is similar to asthma, done by inhalation therapy through inhalers. That is the safest, fastest and most effective way of delivering drugs. Despite this, doctors are not very confident about prescribing inhalers, mainly because of myths and misconceptions about inhalation therapy. Patients think it should be given at terminal stages of a disease. "Mujhe tablet, injection aur cough syrup de do, mujhe ye inhaler nahi chahiye" [I don’t want the inhaler, give me tablets, injections and cough syrup], they say. "Yeh powerful medicine, iska adat padh jaata hai" [It is a powerful medicine, it is addictive], they say. So these are the issues/myths and doctors don’t have the confidence to change the patient’s behaviour or beliefs. So those are the major reasons for low diagnosis rates. Is COPD an irreversible disease? COPD causes chronic lung damage and cannot be cured. If you look at the lung of a COPD patient, it is entirely black and can’t be cleaned. But you can halt the progression of the disease and give drugs that can improve the quality of life and ease symptoms. Patients walk longer distances and survival rates improve, but for that you need inhalation therapy. A 2013 PURE study showed Indians have 30% less lung function than Caucasians. Is that why we have a higher burden of all respiratory diseases? The PURE study is very well done and is a consistent observation that Indians have shrunken lungs, because we have been exposed to air pollution from birth, and because of other factors like nutrition levels. Weak lungs make us vulnerable to COPD. So an Indian born in India who later lives in the United States, will have lung function as good as people living there. So, having small lungs is not genetic. It is completely associated with the environment and is a modifiable factor. We have to find solutions for the practical problems. China’s household air pollution problem was much bigger than India’s. They introduced LPG or biogas as an alternative to coal for heating homes and both DALYS [disability adjusted life years] and mortality rates reduced significantly. So the learning is that you can do something to reduce the risk from household air pollution. Smoking accounts for 12% of COPD deaths in India, household air pollution 33% and ambient air pollution is 30%. For DALYS, household air pollution causes 40%, ambient air pollution 10% and occupation 25%. Farming is the most common occupation in India. For farmers, dry dust raised by crop farming, chemicals naturally released by animals in animal husbandry, and use of pesticides are all risk factors for COPD. Working in construction, mining, leather and pesticides industries are also risk factors for COPD. Which risk factor for COPD would you work on reducing first? Household air pollution is the easiest one. Solutions for reducing COPD from biomass fuel include simple actions like improving kitchen ventilation, which can have a significant impact. There are operational challenges, but if adding one window can have such a big impact, then there needs to be more research on it. The best solution would be replacing biomass fuel with other fuels. LPG doesn’t cause particulate matter pollution, but it emits gaseous substances like nitric oxide and carbon dioxide. The cleanest fuel is electricity, but to produce electricity, you create pollution somewhere else. There has been lot of noise about using solar energy, but it is not feasible. It will give you enough energy to light a bulb, but for cooking you need high voltage, which solar panels cannot produce. Reporting for this article was supported by the REACH Lilly Media Fellowship Programme on Non Communicable Diseases. Pune: Chronic Obstructive Pulmonary Disease (COPD) was the second highest cause of death in India after heart disease in 2017, killing 1 million (958,000) Indians that year, according to University of Washington’s Global Burden of Disease study, 2018. Republished with the permission of IndiaSpend. You can read the original story here.